When Pastor Randall Jackson led his first mission team to Choteau from Nashville, TN in 2005 to help with sanctuary remodeling and Vacation Bible School, he had no idea that one day God would call him to move his family to Montana and pastor this same church. 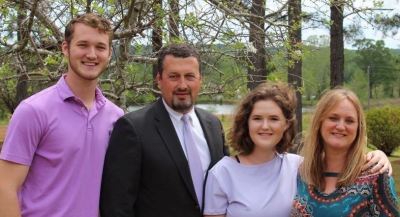 Randall, Becky (wife) and Alena (daughter) moved to Choteau in June 2017 while Bailey (son) remained in Nashville to attend Belmont University. Our identity and purpose come from God's word. According to scripture, after Jesus ascended to Heaven he sent his Spirit to live in the heart of every believer taking our bodies as his "temple" and calling us each to come together in unity as his collective "body", the church. The cooperation, accountability and inspiration that being a part of a local church offers enables us to better fulfill God's great commandment to love him with all our heart and others as ourselves...and to fulfill the great commission to make disciples of all peoples. The disciple-making process can be summarized in 4 moves which God invites every person to experience by grace through faith. Move one is a prerequisite to all other moves, while moves 2-4 may happen throughout one's life as a part of their sanctification. In the context of a spiritual family with grace, truth, accountability and unity, our church is called to help individuals biblically navigate this eternal experience. This is done through the public preaching and teaching of God's word, group Bible studies, mentoring, ministry training and various organic and programmed initiatives. We are among approximately 44,000 congregations who voluntarily partner together for local, regional and worldwide missions and ministries. Each church is fully autonomous making its own decisions, securing its own staff and owning its own assets. SBC churches typically share basic doctrinal beliefs, but may vary on secondary beliefs as well as methods and practice for ministries. Southern Baptists originated and manage the Cooperative Program where each church gives financially (whatever amount they choose) to provide the most efficient missions and ministry funding ever implemented in the Christian church. This impact is realized through many avenues including world-wide church planting, International Missions, North American Missions, State/Regional Missions, 6 theological seminaries in the U.S., world renowned Disaster Relief, Ethics and Religious Liberties Commission, LifeWay Christian Resources, Guidestone Financial Resources and many others. Montana is home to approximately 135 SBC churches with new churches started regularly across the state. The Montana Southern Baptist Convention (based in Billings) is a regional partnership of SBC churches providing comprehensive support for ministry in Montana and helping connect MT SBC churches with our national and global initiatives.